Uncle “Ernie” was a small man, somewhat after the mould of his father, and he was well on in years when I did have, or made, contact with him. He lived at the Shore all his life, nearer to Stanley Bay than Devonport. He married a “tartar” in his wife and had 4 daughters and one son David, who in the course of time had 7 sons and one daughter. 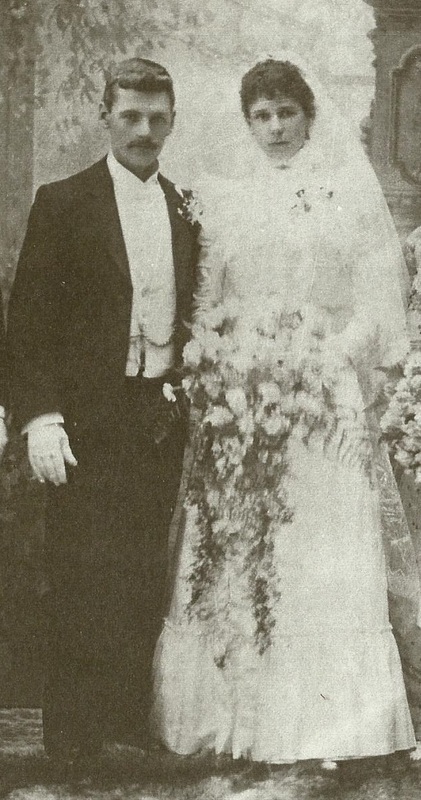 Ernest and Fanny’s Wedding 1898. This side of the Daniel Clan were complete strangers as David had moved away from the Shore and nothing remains of their stay there. Uncle Ernie was known in his early days as Captain Ernie, but I gather he had no affiliation with a maritime occupation, unlike Charles, but because he was expert in sailing 16 footer centreboard yachts on Auckland’s Waitemata Harbour, where he became a prominent competitor in a number of boats of this class. In 1910 and later he was skipper of a fast boat call Mistral, and had a range of successes in other boats well into the 20’s, when he used his daughters as “forrard hands”. It was a well-known fact about the daughters, and also when racing was over there was no fraternization of his crew with the likes of male roughnecks of the yachting world, so they retained an air of mystic as to what they looked like once clear of a “flattie” and the Club. 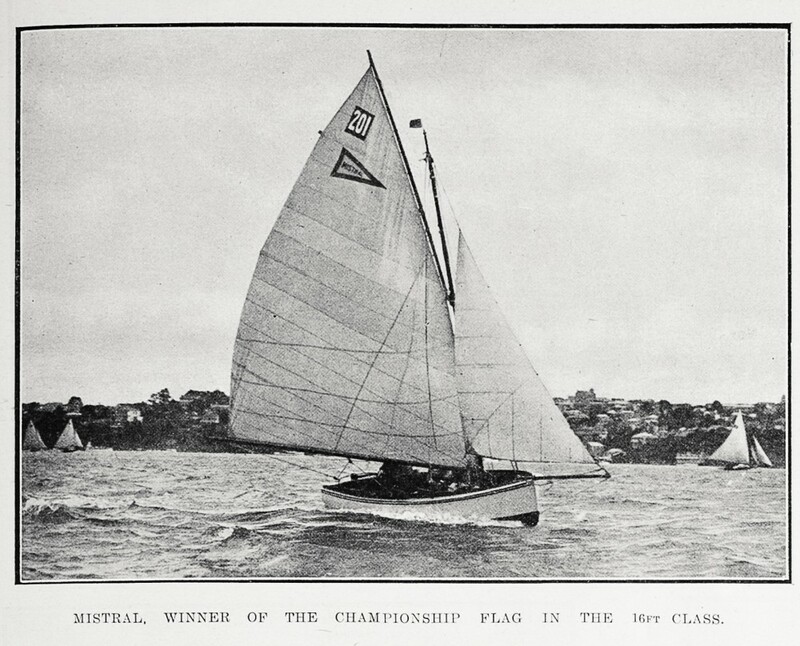 The Mistral was a champion in her class but had a regular male crew, the days of Ernie’s girl crews was much later, and when they had all served their time at the sport, marriage and family involvement meant the demise of probably one of the first girl crew “forrard hands” on Waitemata Harbour. The Mistral 1920 – Sir George Grey Special Collections. Ernest William Daniel was born in London, England about 1873-5 (Birth Certificate unknown). Ernest married Fanny Wood on 28 December 1898, in Auckland (Marriage Certificate Number 1898/4976). They had four children, Dorothy Adeline 1900 – 1971, Jessie Mavis Irene 1904 – 1978, Marjorie 1907 – 1984 and David William 1917 – 1985. He was a “tinsmith” and lived in 12 Russell Street, Devonport, and was listed in the Reserves roll for WW1. He was also a renowned “Bird Man”, and breeder. Ernest dies in July 1933 (Death Certificate Number 1933/1067). Fanny dies eleven years later in 1944 (Death Certificate Number 1944/23722). Both Ernest and Fanny were cremated at Waikumete Cemetery, West Auckland. 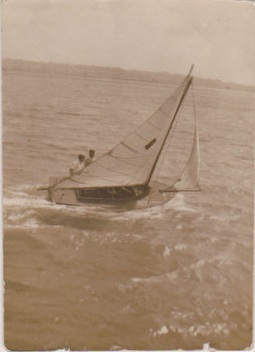 Continuance Y5 owned by Ernest, who won the Lord Gellico Cup in 1921.